Want Detox? We can get you there. Acetaminophen in Percocet, Oxycet, and Roxicet. Even a person using the medication as prescribed may develop physical dependence. 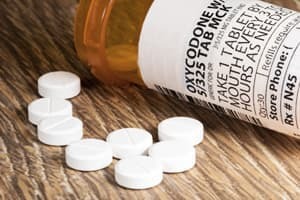 Oxycodone is helpful to many, but as a Scheduled II controlled substance, has a known risk of abuse and dependence; consistent misuse of the substance can lead to oxycodone addiction 1. According to the DEA, more than 16 million people 12 and older have abused oxycodone in their lifetime 1. The risk of oxycodone dependence and addiction increases with abuse, but even a person using the medication as prescribed may develop physical dependence 1,2,3. Once someone who is dependent on or addicted to oxycodone abruptly quits or reduces use, withdrawal symptoms are likely to emerge. Though oxycodone withdrawal symptoms will be different for everyone, many of them can be very uncomfortable and distressing to the individual’s physical and mental health states. People who are addicted to opioids, such as oxycodone, often also have comorbid conditions, such as depression, insomnia, antisocial personality disorder, and post-traumatic stress disorder. Depression can be opioid-induced or a pre-existing condition.5 People who abuse opioids tend to abuse other psychoactive substances, such as marijuana, stimulants, alcohol, and benzodiazapines.5 These co-occurring conditions can complicate withdrawal symptoms and make it more difficult to quit substance abuse. Looking for Help with Detox? Digestive issues like cramps, nausea, vomiting, and diarrhea. Heart problems like rapid heart rate, increased blood pressure, and increased body temperature. Seeking detox services can help to limit or eliminate many of these unwanted oxycodone withdrawal symptoms and improve your outcome. It is possible for two people to have a very different experience throughout withdrawal. Oxycodone formulation – immediate or extended-release. Concurrent mental and medical health issues. Withdrawal symptoms will begin anywhere from 8 to 24 hours after last use. Withdrawal symptoms may last anywhere from 4 to 10 days. With the variability associated with oxycodone detox, it is possible for two people to have a very different experience throughout withdrawal. At times, oxycodone withdrawal symptoms can lead to more significant complications that can impact an individual’s physical and mental health. For example, a person enduring the discomfort of drug detox may quickly begin using oxycodone again to relieve or postpone the onset of withdrawal. Especially in the event that tolerance has lessened in the abstinent period, relapse can result in a deadly oxycodone overdose 7. Mental stress: The unpredictability and discomfort of withdrawal can result in significant anxiety and depression symptoms that can dramatically impact overall well-being. Severe pain: When oxycodone is no longer available to manage pain, the individual may have a more sensitive reaction to pain and discomfort. Dehydration: The sweating, diarrhea, and vomiting during detox can result in fluid balance issues brought on by dehydration and abnormal electrolyte levels. Cardiovascular issues: Detox puts the heart through stress with effects on the person’s pulse and blood pressure. Outpatient detox: Services for people with milder addiction issues and stronger supports, outpatient detox treatment allows the person to live in their home and work while attending scheduled appointments at a clinic, community agency, or doctor’s office. Inpatient/residential: Services for people with fewer supports and relatively more severe addictions, inpatient/residential options provide the individual with housing, detox services, meals, and around-the-clock supervision and monitoring. Some medically assisted or medically supervised detox will focus on eliminating all opioid use while others will offer an opioid medication, such as methadone or Suboxone, as a form of medication-assisted treatment (MAT) 6,9. Either way, the goal will be to promote abstinence and reduce addictive behaviors. Remember, detox is only one step in addiction treatment; formal substance abuse treatment options are needed to maintain long-term recovery 6,9. Drug Enforcement Administration. (2014). Oxycodone. U.S. National Library of Medicine: Medline Plus. (2017). Oxycodone. National Institute on Drug Abuse for Teens. (2016). Prescription Pain Medications: Opioids. Substance Abuse and Mental Health Services Administration. (2015). Detoxification and Substance Abuse Treatment. World Health Organization. (2009). Clinical Guidelines for Withdrawal Management and Treatment of Drug Dependence in Closed Setting. Substance Abuse and Mental Health Services Administration. (2010). Protracted Withdrawal. National Institute on Drug Abuse. (2012). Principles of Drug Addiction Treatment: A Research-Based Guide. Connecticut Department of Consumer Protection. (n.d.). Oxycodone: Protect your teens. Federal Drug Administration. (2015). OxyContin. You can find detox services in and around most major cities. Overview: What Is LifeRing Secular Recovery?